Book Review by Christopher, a Redcliffe student (full name withheld). 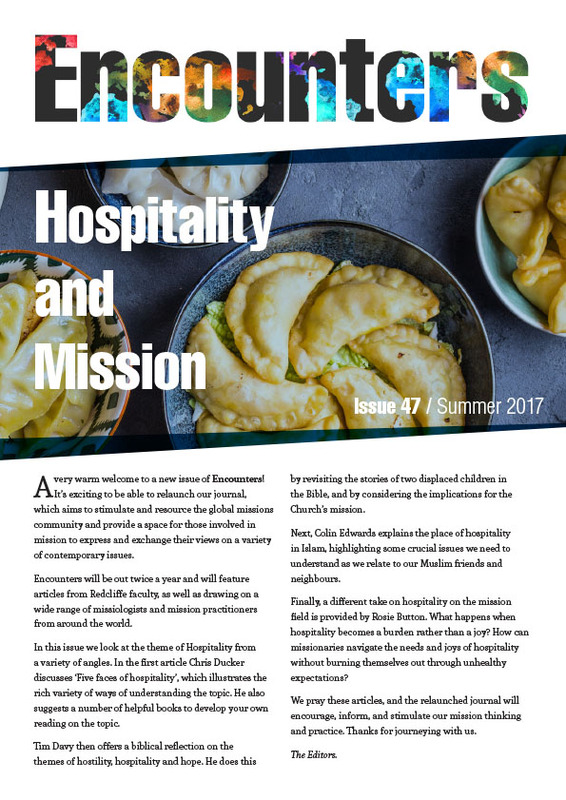 The Changing Face of World Missions is the second book in a planned – and ambitious – eight-volume series, ‘Encountering Mission’, under the editorship of Wheaton’s Scott Moreau (in Issue 11 we reviewed volume 1, Introducing World Missions). As the title and subtitle suggest, this instalment seeks to identify contemporary issues and trends within the global mission movement. The book rightly claims that now is a significant moment within mission, as the twentieth-century fades from memory and new issues, even paradigms, are emerging. The three authors, Michael Pocock, Gailyn Van Rheenen and Douglas McConnell, together with contributions from Ted Esler, Mike Barnett and Scott Moreau himself, argue that there are twelve key issues and trends we must familiarise ourselves with, and then engage with. These issues are grouped into three categories: the global context (which covers globalization, demographics, and the challenges of ‘multiple spiritualities’ and postmodernity), the missional context (covering the shift within Christianity to the global South, motivations for mission, spiritual warfare and creative-access platforms), and the strategic context (networks of collaboration, financial support and partnerships, new technologies and contextualization). Each of the chapters from this comprehensive list is, very sensibly, divided into four sections: identifying the trend, evaluating it, reflecting on it in the light of scripture and theology, and engaging with it by proposing a practical response. This structure will be helpful to the undergraduate students and mission-newcomers this book is principally aimed at, the reader always knows exactly where he is. The downside, however, is that this structure sometimes serves as a straitjacket that artificially restrains and corrals the issue at hand. The Changing Face of World Missions does not strive for, nor achieve, any great depth or freshness of insight. Rather, it serves extremely well as an introduction to contemporary mission, one that is very up-to-date with a good number of references from the last 2-3 years. The reader is assisted by each chapter including a case study, eminently suitable for seminar or small group discussion, in which one is invited to read oneself into the given scenario and respond appropriately – a device which works well. Throughout the book there are also numerous sidebars with pertinent information, website addresses, questions for reflection and key quotes. On the whole, this is a balanced book, which introduces each side of the arguments encountered. Sometimes, however, one is not clear whether Pocock, Van Rheenen and McConnell are making their own assertions or simply rehearsing others’. Often, and perhaps inevitably, a North American bias emerges in terms of language, theology and social analysis – for example, many Christians in Europe and the developing world would question the assertion that “The hand of God is discernible in globalization.” The authors acknowledge that global religions will be radically altered by changing demographics and, in the case of Christianity, a paradigm shift in the orientation of mission. In outlining the nature of these shifts, however, the authors fail to paint a convincing picture of what global mission will be like in, say, twenty years’ time. Such forecasting is clearly not a simple task – but the seriousness of the missionary undertaking should encourage practitioners to think strategically and long-term. The book would have benefited from either an expanded introduction (just seven pages plus two pages of definitions) or a thorough conclusion. Instead, the reader is left with a series of helpful but disparate and unconnected chapters and the overall picture isn’t really brought together. Also, there is little to indicate which of the twelve chapters’ trends are the most important, or how they interact. The Changing Face of World Missions promises to help the reader “discover trends that are changing the shape of world missions,” and it does just that – but this is at the surface-level, not a critical dissection. It functions well as an introductory volume, a signpost to deeper and more specialist literature, and culminates in a helpful 500-work reference list (although a short, key-works bibliography would have enhanced each chapter). Peppered throughout the book are quotes and references from the majority world, although not as many as one would hope for from a book on world missions. Ultimately, this book’s strengths may also be its weaknesses: its great scope means less room for detail; its accessibility means less theological depth; and its barrage of provocative questions are often left unanswered. It speaks sensibly to those finding and feeling their way into mission, with a series of balanced points – globalization can ultimately be a force for good or ill; mission agencies and practitioners should cooperative closely and strategically; Christians must strive to contextualize the gospel for a now-pluralist audience; there is a third way between modernism and postmodernism; the Church’s diversity and global nature should be celebrated and seen as a boon for mission; missionaries need to be alert to spiritual warfare but not overly distracted by it; mission agencies need an established model for the use of money; new technology should be welcomed where it can assist in mission – but the emphasis must remain on people. I would recommend this book to anyone studying mission for the first time, on the grounds that, despite its weaknesses and its somewhat restrictive North American perspective, it is highly accessible, relatively balanced and comprehensive in scope.